Nightmare In the Dark is a Neo Geo ROM Game. 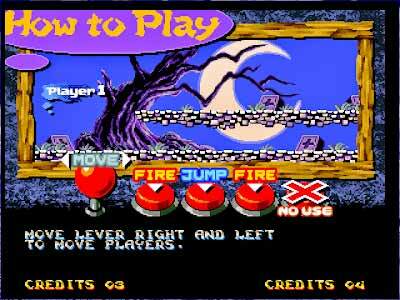 And here I will explain how to run this game through MAME Emulator. You will get a zip to download to play it free in your Computer/PC and Android Mobile. 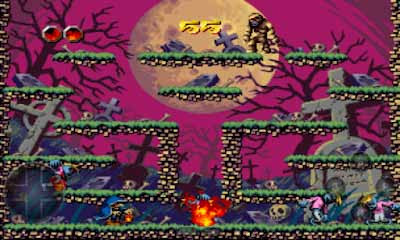 Today I am sharing you one of the most Attracting Ghost / Zombie NEO GEO rom game completely free. The only limitation is for this game is you need an emulator called MAME to play this game in Windows and neo.emu apk file for Android and some instruction I mentioned below. Updated: This Emulator games now supported in Android and I have shared the Nightmare In The Dark Apk for Android. A good ghoul goes around graveyards protecting them from evil doers. The player clears the area and collecting power-ups using it to eliminate the enemies. 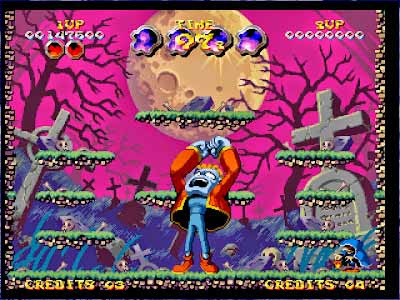 There are five stages with five levels each, and each one of them has you throwing fireballs at ghouls, ghosts, goblins, and zombies. When you keep throwing fireballs at these enemies, they will ignite into a giant fireball, which you can throw at other enemies to kill them, and get the remaining treasure before moving on to the next level. 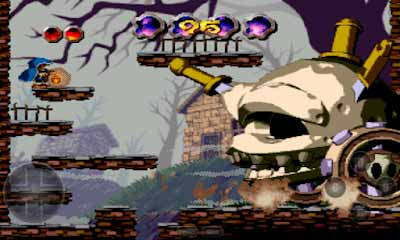 At the end of the fifth level, a boss must be defeated in order to continue the game. Nightmare In The Dark is one of the best and Addicting Neo Geo Arcade Game which you could play using MAME Emulator like you have played Neo Bomberman Apk. This exciting game is available to play in your Computer as well as in your Android. This game is a Multiplayer game. So you can enjoy this game with your friend. This game has not any challenging mode so your friend will act as a helper. To know more about this game you may Visit Wikipedia Free Encyclopedia, Search in Google Search Engine and you can visit Developer's Website. How many stages and bosses in NITD Arcade Game? In Nightmare In The Dark game, there are a total of 5 stages ( on every stage there are 5 levels ) where you have to fight with 5 different bosses. As you advance to a higher level the ghost becomes more vulnerable, so you have to use some strategy so that you could stay safe from them. Here is the list of 5 deadly bosses name. The Boss is ready with his full power, are you ready? Are you ready to play this game in your Computer or Pc or Laptop or Android? If no then see the gameplay here - I am sure you will love to play this game. Then Setup Control ( It is must need to setup control else you can't find control your game) as your comfortable mode. Note: For this game, you can't enter the cheat database from any Android, but on some Android may you can. To go to the cheat database you have to press Select and Start at the same time. You will get unlimited time, life, invisible things and many things from the cheat database. But if your mobile got stuck then you can't use cheat for this game. I have searched a lot more to finding the apk version of Nightmare In the dark. And finally, I found the game. But it is 53.9MB. This game is combined with MAME Emulator and the rom + NeoGeo bios. Here download the game from Google Drive link it's totally free. If you like the game and successfully Played in your Computer or Android don't forget to share it on Facebook.